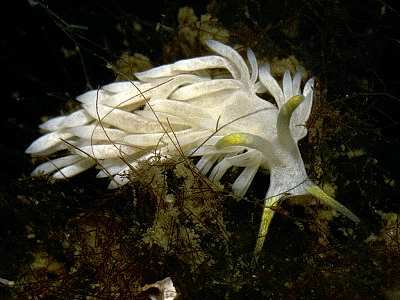 MOLLUSCA : NUDIBRANCHIA : Favorinidae SNAILS, SLUGS, ETC. Description: This tiny species is entirely covered with speckles of white pigment, becoming translucent in the heart region and in patches at the bases of the cerata. The rhinophores and oral tentacles are contrasting primrose yellow in their distal portions, and translucent in their basal halves. The body may reach 13mm in length, but is very thin and difficult to see in the field. Habitat: The diet is unknown. In Lough Hyne the animals are found on silty rock in 6-10m of water amongst algae, sponges and white didemnid seasquirts. The spawn is a fine spiral of eggs. Distribution: This rare species is known only from Lough Hyne in Co Cork and the Naples area in the Mediterranean Sea. In Lough Hyne it has been found on several occasions since its discovery in 1980, and appears to maintain a resident population. Tiny Aeolid with white superficial pigment. Rhinophores and oral tentacles with yellow pigment. Picton, B.E. & Morrow, C.C. (2016). Dicata odhneri Schmekel, 1967. [In] Encyclopedia of Marine Life of Britain and Ireland.